July 7 2018 the Tour de France will start on the island Noirmoutier-en-l’Île (have a look at the parcours of the Grand Depart over here). From there they will travel from place to place over a mainly flat parcours. The parcours of Week 1 leads to many places including Fontenay-le-Comte, Mouilleron-Saint-Germain, La-Roche-sur-Yon, Cholet, La Baule, Sarzeau, Lorient, Quimper, Brest, Amiens, Arras and legendary Roubaix. In this article we will share some insights on the parcours, stages and possible winners during Week 1 of the Tour de France 2018. In the table below you will find an overview of the parcours and stages for Week 1 of the 2018 edition of the Tour de France. 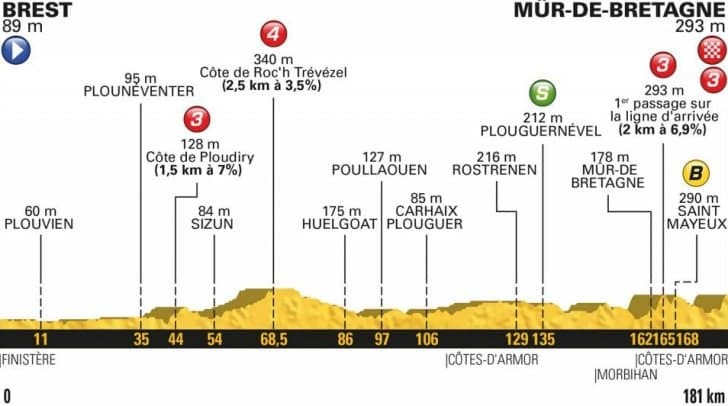 As you can see the peloton will ride five flat stages, two stages with some hills, one team time trail and one stage with many kilometres of cobblestones. Week 1 ends in Roubaix and after this arrival the peloton will enjoy one rest day. After this day the peloton will start Week 2 in Annecy (Mountains). 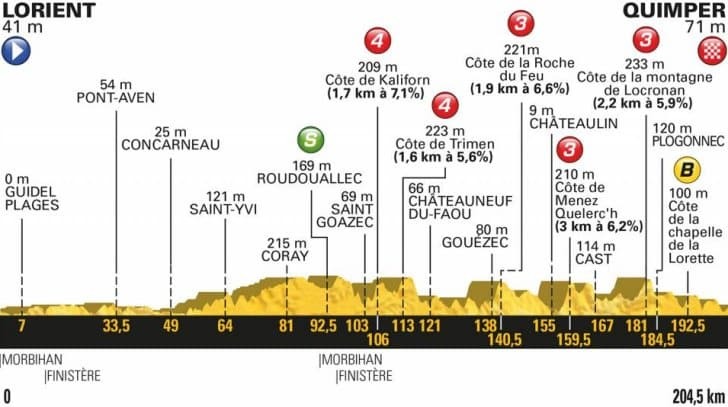 During the first week of the Tour de France 2018 the riders will have to endure 9 stages. Most of them are mostly flat, but a few have some hills. On top of this day three is a team time trail and the last day offers a lot of cobblestones. This should ensure enough fireworks! 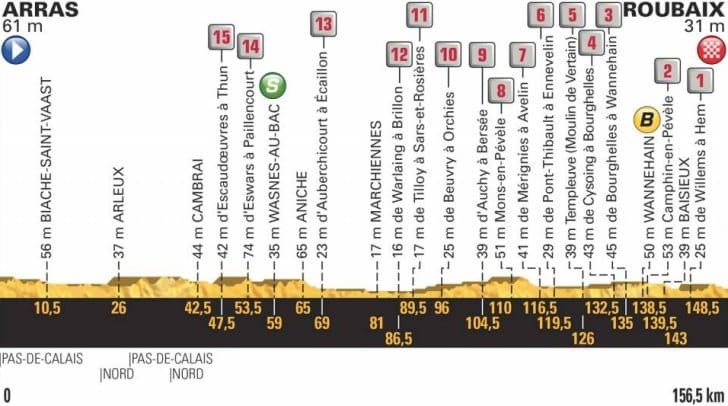 Below we will highlight each stage and explain which riders are the favourites to win*. Have a look at this page for an overview of a starting riders and teams. → Click here to have a look at the Parcours of Stage 1; Noirmoutier-en-l’Île – Fontenay-le-Comte. 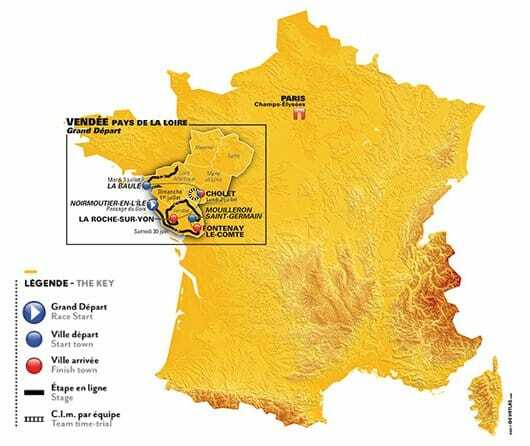 During the first day of the Tour de France the peloton will start on the island Île de Noirmoutier. From this point the peloton will travel to the mainland over one of the bridges since the feared Passage du Gois has a bad reputation for being too slippery. During the Tour de France of 1991 half of the peloton crashed because of the risky roads. 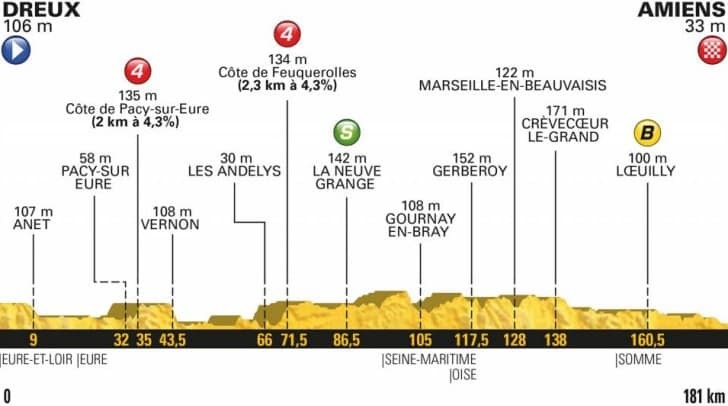 After arriving on the mainland the peloton will ride to Fontenay-le-Comte for probably a mass sprint. → Click here to have a look at the Parcours of Stage 2; Mouilleron-Saint-Germain – La-Roche-sur-Yon. 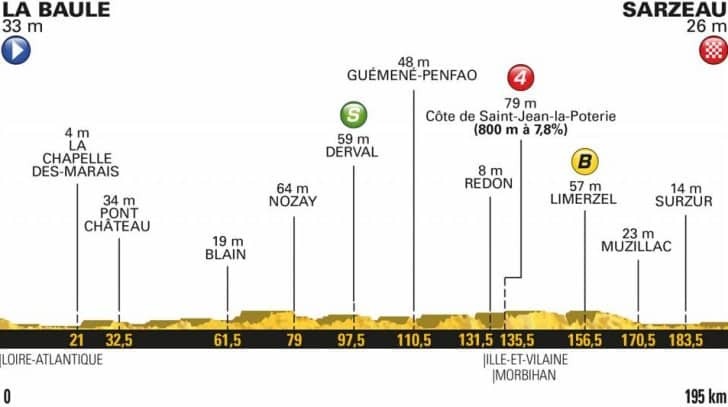 During Stage 2 of Week 1 the peloton will travel from Mouilleron-Saint-Germain to La Roche-sur-Yon. 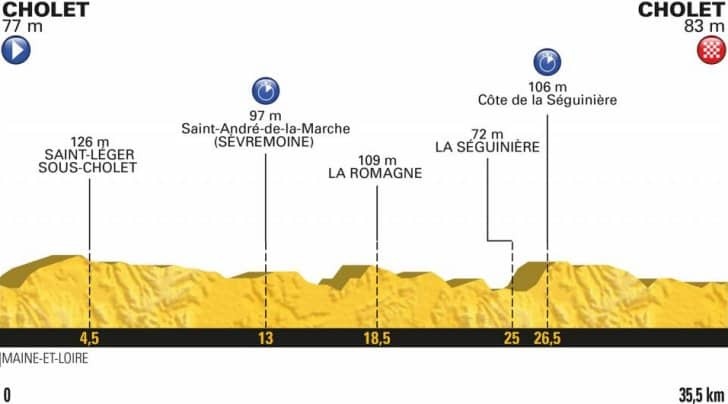 This is a fairly flat stage of 182,5 kilometres. Because of this we expect another mass sprint where the top sprinters will be favourite to win. → Click here to have a look at the Parcours of Stage 3; Cholet – Cholet. During Stage 3 the riders will ride a team time trial. This time trail lasts for 35 kilometres in and around Cholet. During this stage the riders will experience a flat terrain with a few small hills with a gradient of 5% maximum. This stage is perfect for the best and most experiences time trail riding teams. → Click here to have a look at the Parcours of Stage 4; La Baule – Sarzeau. Day four starts near the coast of France at a place called La Baule. From this place the peloton will ride to Sarzeau. During this parcours they will experience a lot of flat terrain and some false flat. We expect this parcours will be won by a adventurer or one of the sprinters. → Click here to have a look at the Parcours of Stage 5; Lorient – Quimper. Stage 5 of Week 1 offers a parcours of 204,5 kilometre including some small hills with a gradient up to 4,8%. This makes this stage perfect for adventurous riders and riders that are looking for a day victory. → Click here to have a look at the Parcours of Stage 6; Brest – Mûr de Bretagne. Stage 6 will be one of the most challenging parcours of the first week because of a double climb up the steep Mûr-de-Bretagne. This makes this stage perfect for the fastest riders and best climbers within the peloton. → Click here to have a look at the Parcours of Stage 7; Fougéres – Chartres. Stage 7 is another flat parcours which is perfect for the sprinters. 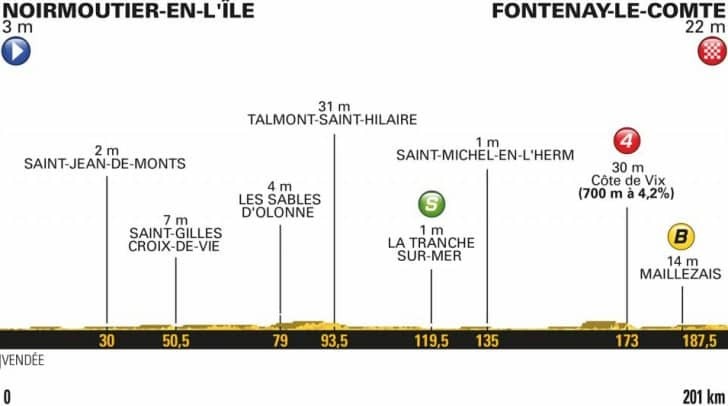 During this stage the teams will ride a total of 213 kilometres between Fougéres and Chartres. Many expect a mass sprint which will be won by one of the top sprinters that have started in this year Tour de France. → Click here to have a look at the Parcours of Stage 8; Dreux – Amiens. Stage 8 consist of 181 kilometres of flat terrain. This make this parcours perfect for a mass sprint. 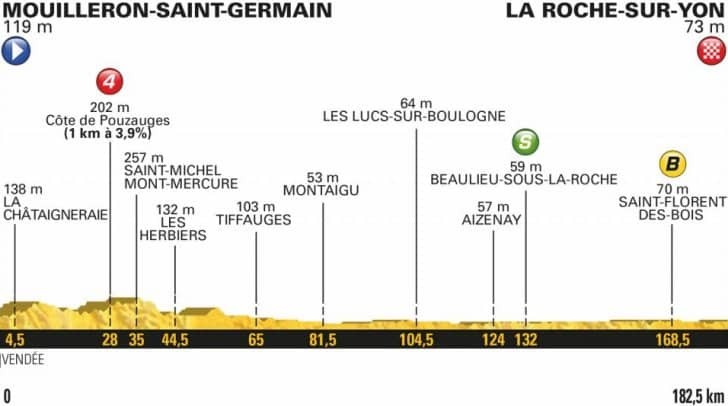 Because of this the following riders will be the favourites to win. → Click here to have a look at the Parcours of Stage 9; Arras – Roubaix. The last week will end with a bang! It was three years ago but this Tour will also feature enough medieval stretches of pave. 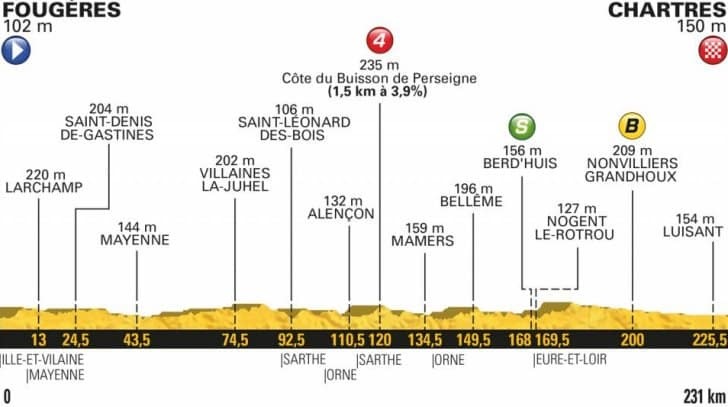 Stage 9 offers a brutal parcours over 156,5 kilometres with not less than fifteen cobbled sectors. Because of this our favourite riders will be the ones that have proven that they can handle cobblestones with ease. * All predictions are based on our opinions. Use this information but always make sure you place your own bets. Find out more of our betting tips for the Tour de France 2018 on this page! If you enjoy to watch the Tour de France then it might be fun to raise the excitement by placing some bets. At the moment you can for example bet on who will win the yellow or green jersey. On top of this you will be able to bet on winners of the other jerseys and of group stages. If you predict the outcome right you can win a lot of money. In the table below you will find a selection of reliable betting sites that offer odds for all major cycling events including the Tour de France, the Vuelta a España and the Giro d’Italia. Open your free account today and collect bonuses and free bets by making a first deposit. A selection of the best sports betting websites which are tested 100% reliable, safe and fair! Sky High Odds on all Major Leagues + €125,- Bonus! BET365 – N1 for Sports! Claim your open account offer today! Bethard Sportsbook Review - Best Online Bookmaker? BetVictor Sportsbook Review - Best Online Bookmaker? Redbet Sportsbook Review - Top or Flop? LV Bet Sportsbook Review - Top or Flop? Bet365 Bonus - Claim your Casino, Sports, Poker or Bingo promotion!